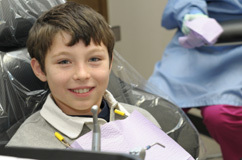 Welcome to the Children & Pediatric (kids) Dentistry of Wellington, the dentist that kids love. Our company offers a variety of dental services – from polishing to cavity prevention – we provide it all. We serve all of those in Wellington and Boca Raton, Fla., and we welcome surrounding areas as well. Our doctors’ experience, reputation and involvement with patients is the reason why our dental office is number one. Children & Pediatric Dentistry of Wellington will ensure that your child has a memorable and enjoyable experience here at the just for kids dentistry. Please visit the Our Dental Team page for more about our interactive, fun office and for more information about our pediatric dentists. 12798 W. Forest Hill Blvd. © 2015 A Dentist Just For Kids - All Rights Reserved.